It's been pretty cold here the last week and it's about killed my cigar smoking since I can only puff outside. Luckily I have alternatives that help me beat the cold. 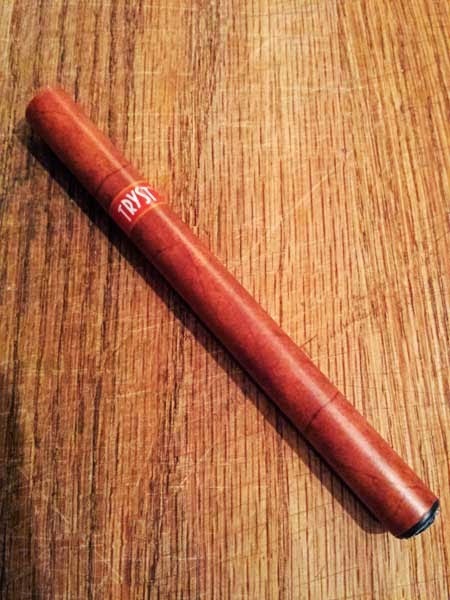 Here's an E-cigar that's a bit different than any of the others that have been reviewed, the Tryst No. 3 Panatella E-Cigar American Classic Cigar. Measuring in around 4 3/4" x 30 ring and weighing .6 oz. this Panatella E-cigar is a lot smaller than any of the others I've reviewed. Don't get me wrong, smaller isn't a bad thing. There are some advantages to the smaller stick. First, it's much lighter than the others I've reviewed making it a bit easier to clamp between my teeth. The wrapper material is different on this e-cigar, it's smooth and shiny, but so far it's just as durable and shows no damage from being held between my teeth. Functionality is great, it produces a good volume of vapor with an easy draw. 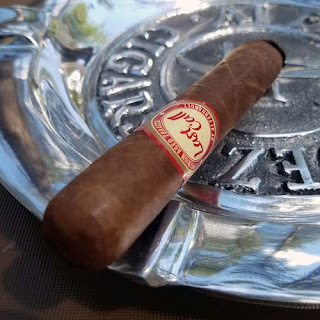 This one is "classic cigar" flavor and overall it reminds me of a mild bodied Connecticut cigar, with a slightly dry finish. Bottom line, not only am puffing on a healthier alternative to cigarettes, I am cutting my smoking costs while getting some cigar like satisfaction when it's to cold to smoke outside. Add American made E-Juice into the mix and Tryst products are a big win-win!